FILE - Former President Jimmy Carter, 93, sits for an interview about his latest book, April 11, 2018, in Atlanta. 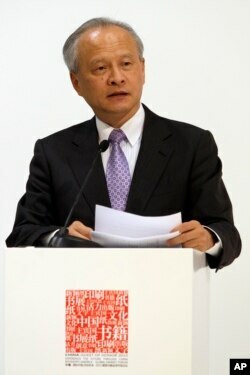 FILE - Cui Tiankai, ambassador of China to the United States, speaks during the opening ceremony of the China pavilion at BookExpo America, May 27, 2015, in New York. Carter’s remarks came during a symposium marking 40 years since the U.S. and China struck an agreement to normalize diplomatic relations during Carter’s presidency. Carter counts the breakthrough with China among the top accomplishments of his presidency. The two countries normalized diplomatic relations Jan. 1, 1979, following an agreement that Carter and Chinese Vice Premier Deng Xiaoping announced Dec. 15, 1978. “The consequences of miscalculation resulting from misunderstanding and misinterpretation can be much more serious than ever before,” the ambassador said.